Frugal Finds: My cheapest yard sale stop EVER – 10 items for 40¢! Wow, I don’t know about you, but last Saturday there were yard sales EVERYWHERE! I had a very busy day filled with appointments and other commitment,s but I did manage to stop at a few and passed by more that I wish I would have had time to stop and shop at. Of course I shopped my parking lot yard sale again. I found one of my favorite booths – everything 25¢ and they even had a free box. The books were 25¢ each and the white linens came from the FREE box I plan on just using the material for something. And my favorite jewelry man was there. Paid $2.00 and these came home with me. Couldn’t pass up this open frame for 50¢. Or these frames when the seller said they were 2/$1.00. 2 matching frames and 2 other frames for 50¢ each! So then I started looking a little bit more! The little apothecary jar and the set of 8 wood napkin rings were on another table which had a big sign – EVERYTHING marked down to 15¢! So everything pictured below, I bought for 40¢ total. I actually had to get change for the 2 quarters I gave the lady! Craziness! Total for the day $5.90 I love shopping and I love the prices at yard sales! 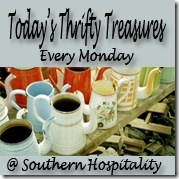 Have you ever bought anything for 10¢ or 15¢ at a yard sale? Were you shocked at the price? I am shocked at the prices you find and the cool stuff. I went to some yard sales today and the lowest price I had was 25 cents on a frame. Lots of fun. well, like I said this was the first time I had ever seen or bought anything for 10¢ and 15¢. I was shocked too! 🙂 25¢ is usually my cheapest. 25¢ on a frame is a great price too!